Earlham is a residential college of about 1,100 students. The campus is located on 800 acres in the city of Richmond, Indiana, about an hour’s drive from Indianapolis, Cincinnati, and Dayton. A global perspective comes naturally to the campus community. Earlham is ranked sixth among all colleges and universities in the United States for the percentage of international students enrolled by U.S. News & World Report. Students are involved in more than 60 student organizations. Earlham has an active Pre-health Club (includes chapter of AMSA), a HOSA chapter, and a student-run MCAT preparation course. In recent years, 40% of Earlham students who applied to medical school also played varsity athletics. The College is a member of NCAA Division III and fields 20 varsity sports. Earlham has invested more than $70 million in new or renovated buildings, including science facilities with state-of-the-art research labs, a center for visual and performing arts, a student center, and baseball and soccer stadiums. Fifty percent of Earlham students who applied to medical school participated in an international off-campus program. 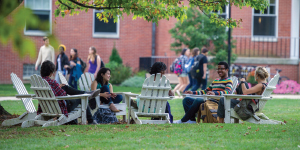 Founded by Quakers in 1847, Earlham College offers a distinctive focus on collaboration and hands-on learning—including funded internships or research opportunities for every student—as it prepares graduates for lives of purpose and accomplishment. What brings students to Earlham? For starters, a world-class faculty. Among all schools, The Princeton Review ranks Earlham seventh in the nation for “Best Classroom Experience.” U.S. News & World Report regularly includes Earlham in its list of schools with a strong commitment to undergraduate teaching. 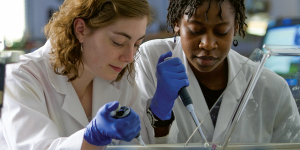 Earlham graduates have a 90% acceptance rate to medical school and other health-related graduate programs. Earlham’s health career advisors have decades of experience, areactive in the National Associationof Advisors for the Health Professions, and make use of a cutting-edge e-portfolio advising system forPre-health students. In recent years, Earlham’s Pre-health advising has helped graduates gain admission to top schools such as the University of Chicago, Dartmouth, and Harvard. Earlham Pre-health students are given opportunities to excel. One of thosekey opportunities is the EPIC Advantage, Earlham’s commitment to fund an internship or research experience for every student. Earlham isone of the only schools to make such an offer, and it allows students, regardless of income, to find opportunities in the United States or internationally for research or career-empowering internships. • Graduates from the past five years have earned prestigious awards such as the Rhodes Scholarship, Fulbright Scholarship, the Watson Fellowship, the National Science Foundation Pre-doctoral Fellowship, the Samuel Huntington Public Service Award, and a Fellowship at the Carnegie Endowment for International Peace. • Of all colleges and universities in the United States, Earlham ranks in the top 2% for its percentage of graduates who go on to earn research doctorates, a distinction that demonstrates the level of academic quality and mentoring at Earlham.